I have heard from Cindy that she has received my HOE Early Christmas Exchange, it is from Just Cross Stitch 2007 Christmas issue I stitched it on natural 32ct linen with recommended threads. 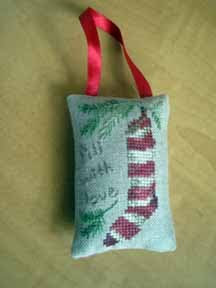 I really enjoyed stitching this and may do a few more to give to friends at Christmas. 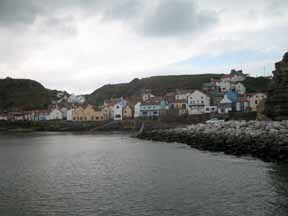 This is one of my Hubbies photo's he visited this Village on the North Coast of England when I was at my bead workshop a few weeks ago it is a tiny Village called Staiths you have to walk down a steep hill to get to it like so many of the Towns/Villages on the North Coast. 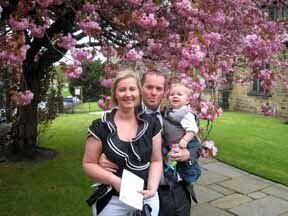 Here is my Nephew Thomas with his Parents outside the church on the day of his Christening, he was very good as the Christening was at the beginning of the service and we were in church for over an hour. I had mentioned in an earlier post that I was doing a class in wire and bead work here is a finished piece, we usually make alot of samples in class so that we learn the technique, so I have managed to make a necklace from some of the techniques learnt. 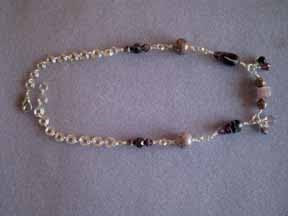 Wrapped loops, use of head pins, double jump rings and curly links, as you can see my beads are in my favorite colour purple. Your Christmas ornie looks wonderful! You did a great job. Thomas is adorable, such a cutie! Your necklace is very pretty. I love the color of the beads.